Be swept up in the colour and movement of local festivals, the healing magic of voodoo, tribal drumming and trance-dances on this enchanting journey to a surprising and still largely untraveled part of Africa that will leave you truly amazed. 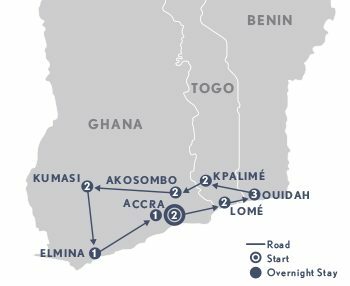 A fascinating cultural odyssey to the vibrant West African nations of Ghana, Togo and Benin, home to some of the world’s most welcoming people. Explore bustling colonial cities, palm-fringed beaches and tiny fishing villages. Visit vast forts and castles built on the back of the gold and slave trades by European colonists: Portuguese, Dutch, German, French and British. Immerse yourself in the long history of ancient African kingdoms and cultures that predate colonisation by centuries, and experience the vital rituals and traditions that still survive and shape life today. Be swept up in the colour and movement of local festivals, the healing magic of voodoo, tribal drumming and trance-dances on this enchanting journey to a surprising and still largely untraveled part of Africa that will leave you truly amazed. Joining the July departure is Sujata Raman, Regional Managing Director of Abercrombie & Kent Australia / Asia Pacific, a position she has held for over a decade. Passionate about seeing the world and experiencing its cultures, Sujata has lived on three continents and visited all seven over many years. Having attended the American University in Cairo and travelled extensively in North Africa, East Africa and Southern Africa, Sujata is now looking forward to exploring the fascinating lands and cultures of West Africa. On arrival into the Ghanaian capital, you are met and transferred privately to the hotel. The rest of the afternoon is at leisure before a tour briefing and welcome dinner. Spend the day touring Accra. Start with a guided visit to the National Museum and the old quarter of James Town. After lunch, visit the Africa Artist Alliance gallery showcasing artworks, sculptures and carvings from established and emerging African artists. The day ends with a unique visit to a fantasy coffin building workshop. Admire the collection of special handcrafted coffins which reflect a variety of shapes from fruit and animals to fish, cars and planes. These flamboyant coffins are now collected worldwide and exhibited in museums. Return to the hotel late afternoon with the rest of the day at leisure. After breakfast, drive into Togo and on to Lomé (200km, approx. 5 hrs), the vibrant capital of Togo. Lomé is the only African city which was a colony of the Germans, the British and the French and has developed a unique identity reflected in the lifestyle of its inhabitants and in the architecture of the town. Arrive at the hotel in time for lunch with the rest of the day at leisure. A full day in Lomé starting at the central market with its famous “Nana Benz”, women who control the sale of the expensive colourful wax printed fabrics made world famous by the women of Togo. Continue to the administrative quarter with its colonial buildings and then the voodoo market where an eclectic assortment of all the necessary ingredients used by traditional healers for magic charms is on offer. Later today meet a local artist in their workshop. The modern Togolese school of artists has become renowned with exhibitions of their work in Europe over many decades. Depart Lomé and head to a remote village to visit a voodoo priest, commonly known as a witch doctor, to get a deep understanding of the voodoo culture and healing powers of its spirits. Then join in a voodoo ceremony: the frenetic rhythm of the drums and the chants of the mediums helps call in the voodoo spirit which takes possession of some of the dancers who fall into a deep trance. Afterwards cross the Benin border and board a boat for the journey to the coastal town of Ouidah. Stop along the way at remote fishing villages to see how the locals live, and learn about their traditional farming and fishing techniques. Drive 1.5 hours to Lake Nokwe and on by motor boat to Africa’s largest stilted village, Ganvie, situated in the middle of the lake. After lunch continue to Abomey and visit the UNESCO World Heritage listed Royal Palace. Now a museum, it displays items belonging to the ancient kings: thrones, cult altars, statues, costumes and weapons. The kingdom’s main economy was for a long time based on the slave trade. A walk around the site helps the visitor recall the court’s past splendours. Return to Ouidah stopping en route to attend an Egun dancing masks festival. Egun masks represent the spirits of the deceased and according to the local population they “are” the deceased. The men wearing the masks representing Egun are initiates of the cult. Dressed in brightly-coloured clothing they emerge from the forest and form a procession through the village streets performing a kind of bull fight. A day spent in Ouidah, one of the main slave ports in the 18th century. Visit the python temple and learn of its importance to voodoo culture. Stop by the Catholic Cathedral and continue on foot to the Ouidah Museum displaying a collection of local contemporary art. After lunch visit the Portuguese Fort, now a museum on the history of Ouidah and the slave trade and continue to the nearby slave market where thousands of slaves were paraded and sold to the highest bidder. The city tour ends by following the “slave road” to the beach, the point of “no return” where slaves were loaded on ships. This morning drive to the Togo border and continue into the rainforest region that surrounds Kpalimé, a town with a rich colonial past, now an important trade centre. Along the way stop at local villages including Tado which is considered to be the 12th-13th century birthplace of the Aja people. See villagers preparing harvested goods for sale, family meals, locally brewed beer in village “bars” and visit a village school. A morning walk in the nearby tropical forest with an entomologist reveals many endemic butterflies and insects, and gain an understanding of how plants are used in local art and medicinal remedies. After lunch, optional tour available of Kpalimé visiting the colonial buildings, bustling market place and the local arts centre. This morning head to the Ghana border crossing and on to the Monkey Sanctuary of Tafi Atome which was created in 1993 to protect a community of sacred monkeys living in the forest. Take a leisurely walk led by a local guide to see the resident mona and colobus monkeys. Arrive into Akossombo late this afternoon and check into your lovely resort overlooking the Volta River. Evening at leisure. A full day at leisure to enjoy the resort facilities. This afternoon there is an optional visit to the bead factory where traditional techniques are still used to create brightly coloured beads from ground down scrap glass. A 5 hour drive today to Kumasi, the historical and spiritual capital of the old Ashanti Kingdom. The Ashanti were one of the most powerful nations in Africa until the end of the 19th century. Visit the Ashanti Cultural Centre where a rich collection of artefacts is housed in a wonderful reproduction Ashanti house. Later on attend a traditional Ashanti funeral which is a festive and powerful community occasion where mourners wear beautiful red or black togas – a fascinating sacred experience. This morning visit the Royal Palace Museum before attending the splendid Akwasidae Festival. This traditional ceremony maintains ancient Ashanti rituals with a procession of royal court attendants bringing gifts to the King, storytellers reciting ancient tales, dancers and drummers performing and trumpeters playing horns of ivory. This afternoon visit the sprawling central market, one of the biggest in Africa. Every type of Ashanti craft (leather goods, pottery, Kente cloth) is found here, along with just about every kind of tropical fruit and vegetable. This morning drive 4 hours to Elmina located on the south coast of Ghana. Ruled by the Portuguese, Dutch and the British, Elmina has a rich history. Arrive at your seaside resort in the afternoon with time to relax before dinner. Visit the UNESCO World Heritage listed Elmina Castle, the oldest European building in Africa, erected by the Portuguese in the 15th century, and the 19th century Dutch cemetery. Outside the castle is the local fishing village, where large colourful canoes are guided by skilled fishermen through strong ocean waves and currents to earn their living. In the old town, see the important Posuban shrines of the old Asafo companies and stroll through the alleyways of the old town with its lively atmosphere reminiscent of colonial times. After lunch, return to Elmina with a special farewell dinner tonight. Early this morning, you will travel back to Accra (180km, approx. 4 hrs). Enroute, you will stop to have lunch, before transferring to the airport for departure. Last group event: Lunch at 1.00 p.m. on Day 16. Tour inclusions All accommodation as detailed on a double/ twin share basis with private facilities; meals as specified; bottled water during transfers and touring; airport welcome; assistance with luggage and group transportation by private air-conditioned vehicle; services of English speaking A&K Resident Tour Director; economy flights only if specified as included in itinerary, all entrance fees, planning, handling, operational and communication charges, all tipping. Tour Exclusions International flights not specified as included, visas, insurance coverage of personal loss, injury, illness or damages incurred during your trip; items of a purely personal nature such as drinks, laundry, dry cleaning, internet, fax or phone charges; transfers, sightseeing or meals not specified in itinerary; excess baggage charges.